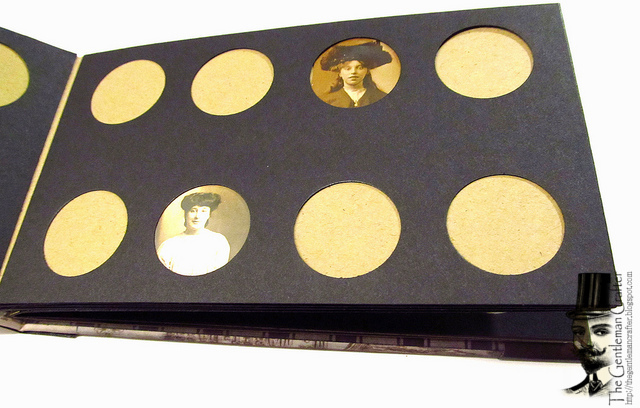 The Gentleman Crafter: A New Vintage Book From An Antique Inspiration! Just going through the things on my To Do list this morning! 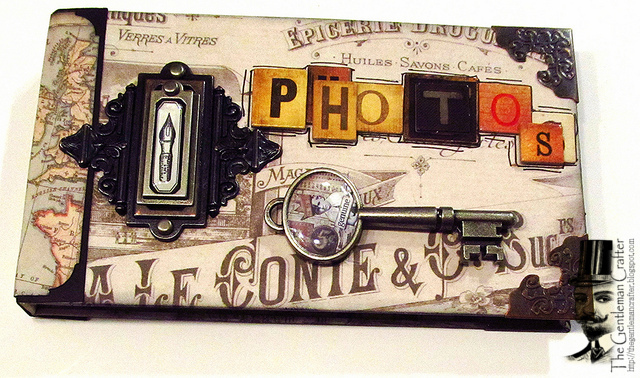 I wanted to share with you all a little project that I finished last night using some of the new Tim Holtz Idea-ology pieces! Yahoooo! Love them! My friend Fiona sent me an antique photo album this week. I was so intrigued with how the bookmakers made the pages for the pictures that I knew immediately I needed to give this little album a try. Supplies Used Can Be Found at Inspiration Emporium. Inkssentials Surfaces Kraft Cardstock - 12" x 12"
Thanks for Coming By! Have an Awesome Day! Wow, that's so cool. Loving it!. Have a good weekend. Wow, I love it! I'll definitely have to make one of these. There are plenty of possiblities by changing the size and shapes of the apertures. Thanks for the video Jim. Enjoy your weekend. This is cool! I love it! Tims "French Industrial" collection is my favourite collection EVER! I've got just pictures for an album like this. I knew you'd figure out how to make the little photo book...just didn't expect it so soon...LOL!!! I love everything about your little book! Thank you sooooo much for the video, too!!! I love it, I can see all different uses for this book to. Leave it to Jim, he can figure out anything! Thanks for the great tutorial. Another great idea and another fab tutorial, thanks Jim I can use this for all those little photos I have hanging around that are too small to go in a regular album. Really love it, what a fabulous idea! So Cool! Love it. You are so creative. Thanks for sharing the video too. You are keeping me sooooo busy Mr. Jim!!!! Another project I gotta do! Love it! So different. Love the way the pictures are displayed. ... and thanks for the tip on the knobs at HL. I ran right over there. Enjoy your weekend. It's so cute. Love how it only took you 8 minutes to do pages, I know it will be an ALL day project when I sit down to do it. It would make a great baby gift...not that any of my friends are having babies these days. Really cool! I can't wait to try this concept. Great cover ! I Got some of those new Idealogy embellishments, they are awesome, so fun !! This looks stunning!! thanks for sharing the video....greetings from the Netherlands...Francien. Amazing! 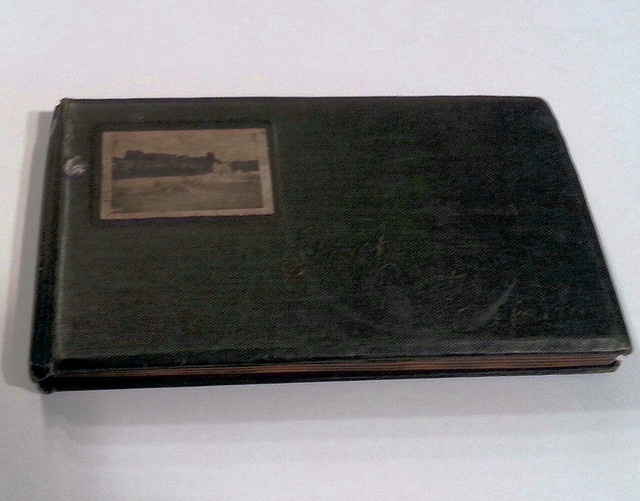 My great grandma had an 8x10 book like that - covered in Red velvet with kind of a hinge clasp for closing. I could look at that album for hours!! Thanks for sharing! Another GREAT and stunning project you have done Jim!!! 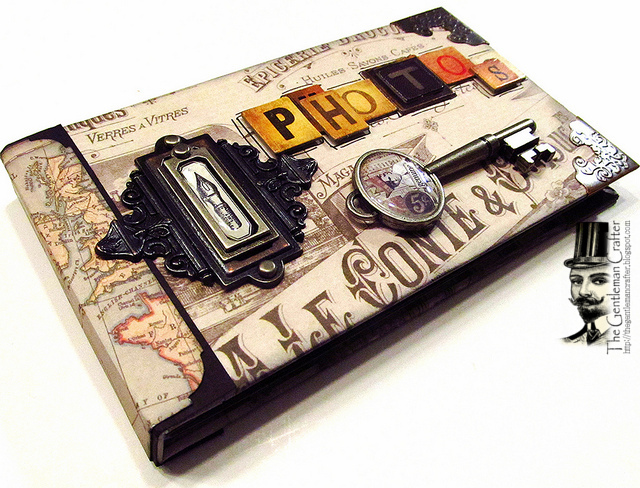 I love to art journal but I am tempted to try this!! Thanks again for showing us your wonderful talent. Jim, not only do I appreciate your posting of your book but thanks for the wonderful recall of memories as I looked at it. I remember the picture books that laid around and how the photos were in the oval layouts. As the song goes "thanks for the memories!" Hmmm... I love them both! I will watch the video a little later, as I have so many things to finish up today!!! What a great project. So cool to see your inspiration and the way you translated it into your own book. You really are amazing! Such a gorgeous finished project. Someday, many years from now, some crafter of the future will study your album and figure out how to make one. That is so cool!